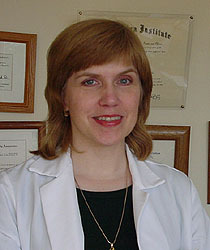 I am a board-certified physician who has been practicing family medicine for the last twenty-seven years. Over this time I have been privileged to know thousands of wonderful patients who have let me into their lives. These relationships have enriched my life and made my work worthwhile as I helped them with their problems. They have also helped me with a few of my own! I originally grew up in Columbus, Ohio. After majoring in pharmacy and biology, I attended medical school at the Medical College of Ohio, then went on to a family medicine residency at Hahnemann Hospital in Philadelphia. I practiced in Wilmington, Delaware for a few years before moving to the Bay Area in 1983. My husband, Jerry Warren, Ph.D, is a clinical psychologist. Besides keeping me sane, he has spent countless hours to help our current practice to come to life. Our two sons, Gene and Joe, have been a great help to us since the beginning of Burlingame Family Health. They have assisted us in operating the laboratory, our computer and software equipment, special projects, and in giving us the best advice on how to accomplish our goal of providing health care in the technological age. They will be leaving soon to complete their professional training and begin new careers. They go with our blessings, thanks, and love. We have been working very hard to build the kind of practice that can give our patients both the benefits of recent technical advances and maintain the personal touch. We have assembled at great team of physicians. We have tried to streamline the necessary paper work so that we can spend more time with patients. We are making our office more comfortable and adding services that make your visits more convenient and productive. Thank you for being so patient during our building process! When I am not at work, which happens occasionally, I like to go on long walks, listen to good music and spend time with our family. Our youngest daughter is now 28 years old. Strangely, I enjoy reading, generally about medicine. I am most interested in disease prevention, the science behind keeping us all healthy. At a time when half of the physicians in California plan to leave practice within the next three years, we are committed to staying around for the long run. We hope that you join us.